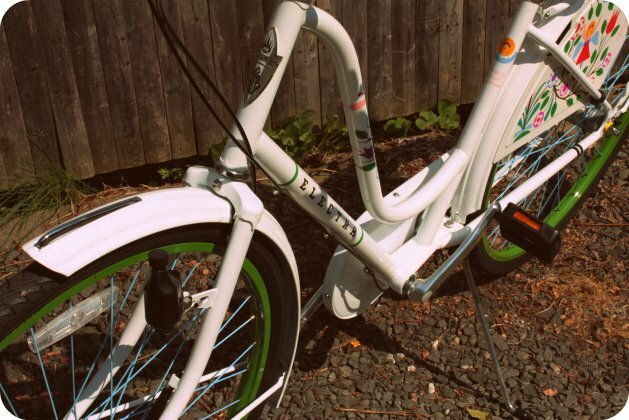 My mom lent me her brand new Electra Amsterdam, though I'm not really feeling up to riding very far. I did get a few turns around the backyard at least. This bike is incredible. A classically built Dutch steel frame with a big cushy seat and decorated with the work of Alexander Girard. Its got a modern folksy vibe with winding vines of flowers and fairy-like girls printed on it. I'm completely in love with my little blue three-speed for everyday errands and getting to work, but this is a bike for getting ice cream, riding along the beach, and enjoying the sunshine. In other words, activities where the risk of it being stolen is low! 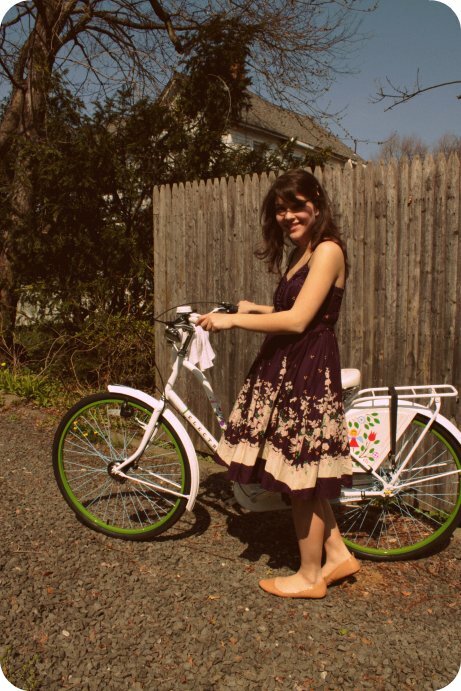 Everything felt sweet today, my dress, the bike, an Easter basket I made for my mom, and a Tiramisu! I hope everyone had as lovely an Easter as I did. Oh, I love that bike so much! 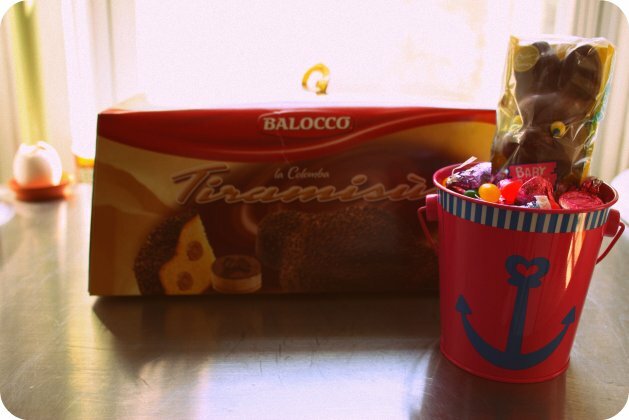 And what a cute anchor bucket! oh my god that bike is beyond gorgeous! that's such a great bike ! i love ur skirt too ! Love the photos!!!!! 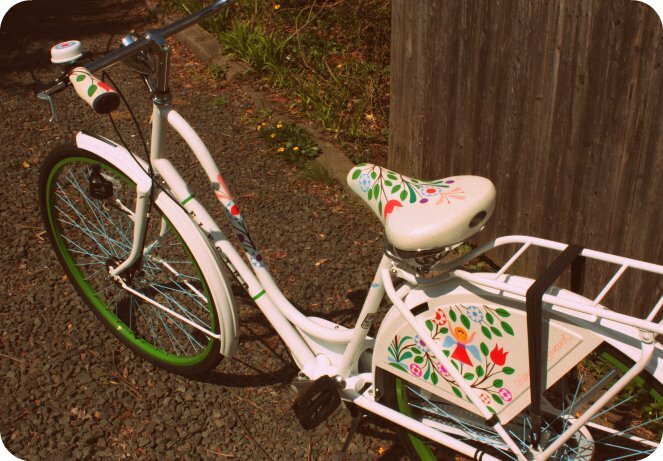 so cute, i love the bike. aNd u LOoK sO PReTtY wiTH uR HaiR LiKe tHaT..
hey! saw your comment on last boat leaving and thought I'd come visit :) these are such gorgeous photos! love the slightly vintage look with the curved corners and such! that bike is awesome... and I love your hair pins! It's beatiful! I wish I had a pretty bike for lazy rides. That's the most gorgeous bike I've ever seen! When I live in Paris, I will have one like that. yeah I know, girls so do dress for other girls! I do take it into account when thinking about what I'm going to wear when I go out with my boyfriend though - I wear clothes that are more appealing to him than other girls, even though he's pretty easy with my style. a lot to think about huh! haha. That is such a pretty bike. It's perfect for you. ooooh I love that bike! Your dress is so cute! What great photos of you on that fabulous bike! Hope you had a great Easter! I am coveting that bike. You remind me of Zooey Deschanel in 500 days of summer in that last photo. I'm moving to a new town soon where everyone rides bikes all of the time. I think I NEED to get a bike like this. Also, tiramisu? Best dessert ever! That bike and these pictures are the cutest ever! Love your bike! And flats! You looks beautiful! Wow, that bike is so pretty! You look absolutely beautiful...I'm so jealous of your skin! oh wow, i love ur mom's bike! 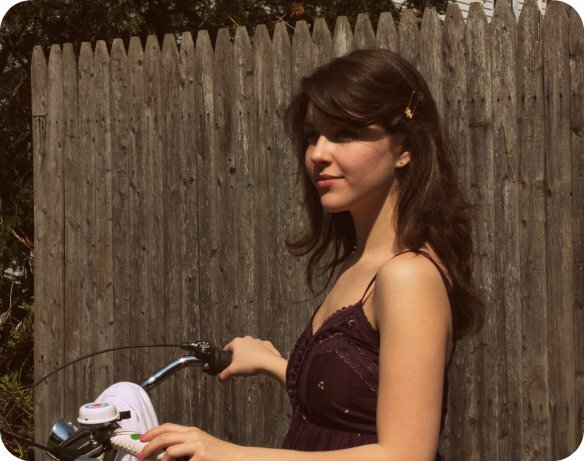 u look so cute in ur dress riding the bike:) what a sweet easter basket! i actually have that same bucket hehe tarjay? :) let me know how rent the runway goes! i know what u mean, it's such a lifesaver! i haven't had a chance to rent one, yet, but i will def rent soon! have a great week! That is the coolest bicycle ever!!! Hi, I'm friends with your mom, and referenced this post on your blog in my informative links. Thanks.